I like the one in the sunlight – it highlights the details more. But they both show the autumn colours & textures beautifully. Thanks, Brona and thanks for stopping by. Have a great day! There is beauty even in “decay,” isn’t there? I love how you captured the bird feeder against the fall leaves, symbolic of decay in its various forms. Thanks for sharing….and thanks for visiting my blog. Thanks, Laurel and thanks for stopping by. I very much appreciate your comment. Have a great day! 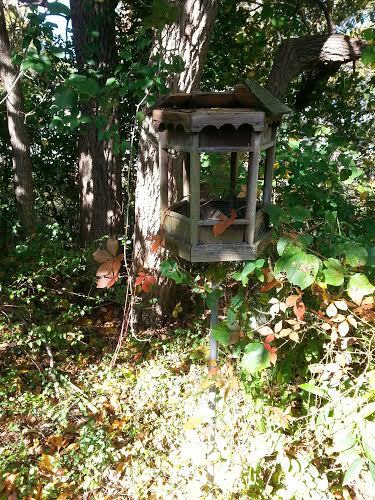 Even though the bird feeder is deteriorating, it still holds your memories of when your father-in-law first gave it to you. Love your pictures of that treasure in its setting. 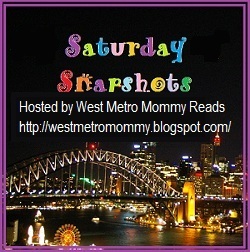 Here’s the link to my Saturday Snapshots. Thanks, Sandy, that’s so true. Glad you liked it and thanks for stopping by. Have a great day! I like the one in sunlight best too. But the second one really makes it look forlorn and forgotten, even though you really haven’t forgotten it. You’ll be glad you have the pictures. Thanks so much for your comment and for stopping by. I’m glad everyone is getting what I intended from the photo. Have a great day! What a clever man. I have never seen a bird feeder quite like that. Thanks, Ginny. He bought it from a man who did all kinds of interesting lawn ornaments. Thanks for stopping by and have a great day! Hi Cat! I agree, it’s hard to have the feeders for JUST the birds. Squirrels always seem to get in. Thanks for visiting and please stop by again. Have a great day! That birdhouse is beautiful. 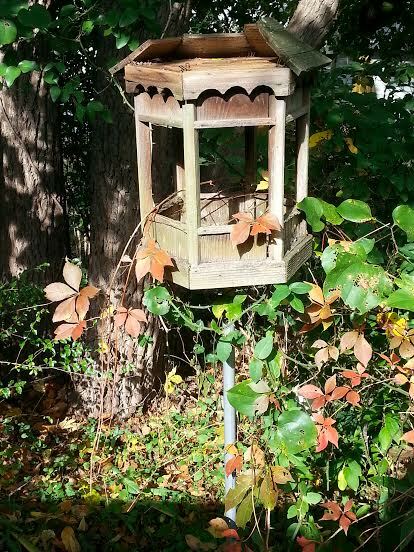 And I agree with some of the other commenters, the first photo really highlights not only the bird house, but the fall leaves around it.